Members of the Rapidan District attended the Ruritan National Convention from January 6-10, 2016 at the Hyatt Regency Hotel in Jacksonville Florida. The National Convention provided the opportunity for all Ruritan members to attend interesting and helpful training workshops, vote on important policy modifications, elect the 2016 officers, celebrate Ruritan accomplishments during award ceremonies, and plenty of opportunities for fellowship with other Ruritan members from around the country. Several Clubs and Districts held Hospitality Rooms several afternoons and evenings, with free food and beverages, and fellowship available to all who dropped in. 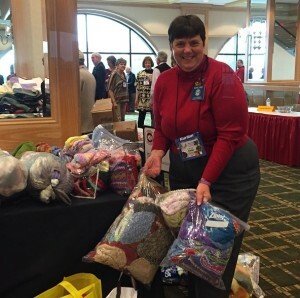 Plastic bags filled with Hygiene items (total number donated by the District unknown at this time) for the local homeless shelter, 175 hand-made chemo caps, 14 blankets, and 91 hand-made afghan blocks donated by the local clubs of the Rapidan District were delivered to the convention. 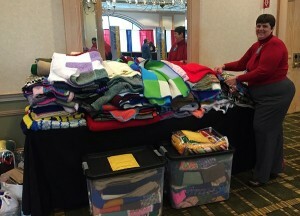 Other Ruritan Districts and Clubs also brought donations, and the total collected for the convention were: 360 hygiene bags, 670 chemo caps, 93 blankets, and 1030 afghan blocks. 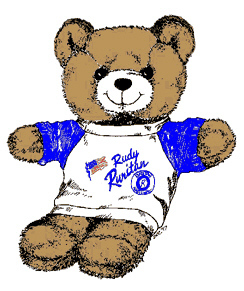 In addition, over 250 Rudy Bears were donated by clubs and Districts, for donations to hospitals, the Red Cross, and the local homeless shelter. Linda Bradshaw led a workshop on creating Facebook Pages and Websites for Ruritan Clubs and Districts the afternoon of Thursday January 7. Perry Marshman was the song leader for the singing of America during the Opening Ceremonies the evening of Thursday, January 7, and assisted National Director Sarah Kelly with the presentation of the Flag Ceremony. Irene Luck carried the Arkansas flag during the ceremony. Steve Hicks helped with the technical aspects of the voting booths during the elections Friday, January 8. New to National conventions this year, was the opportunity for delegates to use their laptops from their hotel rooms to log into MMS to vote instead of physically standing in line to vote. Those choosing to vote from their rooms, using their laptops, reported no issues in the process. Laura Newell-Furniss, Director of Hunters for the Hungry, presented a certificate of appreciation Friday, January 8, to the Rapidan District for their participation in Hunters for the Hungry over the past twenty years. 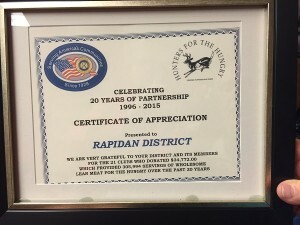 Over the course of twenty years, twenty-one clubs in the Rapidan District have donated $34,722 to Hunters for the Hungry. That translates into 305,994 servings of venison to needy families! Accepting the certificate of appreciation on behalf of the Rapidan District were Linda Bradshaw (2015 Rapidan District Governor) and Irene Luck (2016 Rapidan District Governor.) Ms. Newell-Furniss also gave certificates of appreciation for the local clubs to Irene Luck, for distribution to the local clubs. This story appeared in the December 7, 2014 edition of the Culpeper Star Exponent. This story is a result of a press release being sent via email to local newspapers. This is evidence that sending press releases to local newspapers will result in publicity for our local Ruritan Clubs! 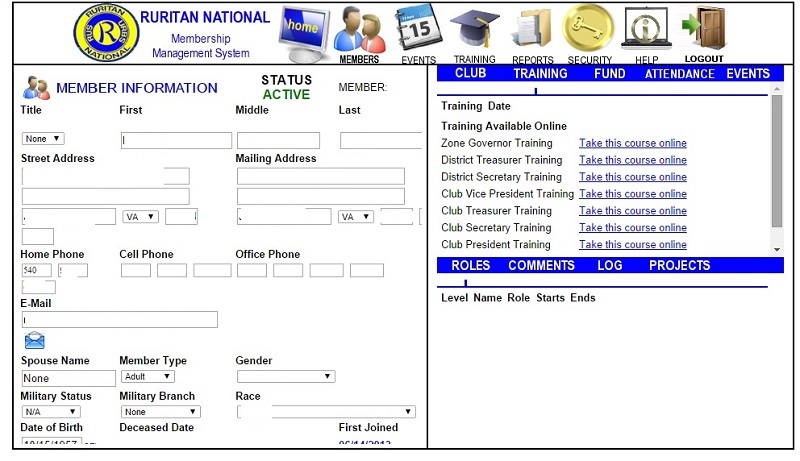 All local Ruritan Clubs are encouraged to send press releases to their local newspapers! 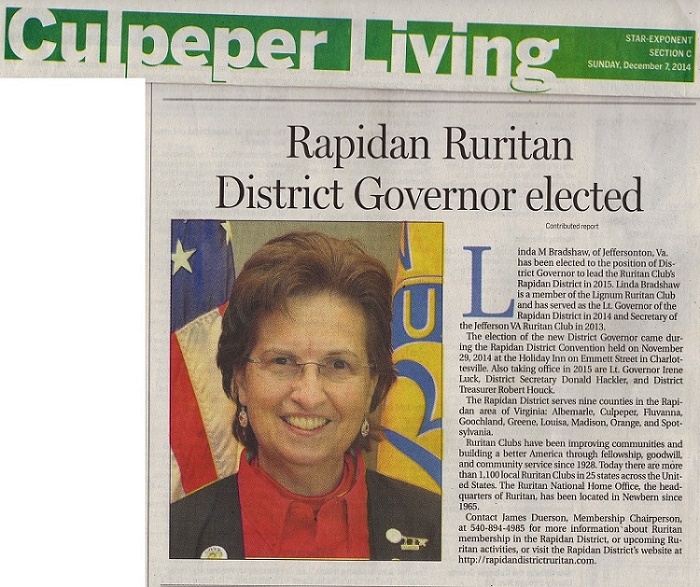 The Annual Rapidan District Convention is scheduled for Saturday, November 29, 2014 from noon to 9pm. The Convention will be held at the Holiday Inn at 1901 Emmett Street North in Charlottesville, VA. The Rapidan District Convention is the time that all twenty-four clubs in the Rapidan District come together to vote on important issues that affect all the clubs. We hold silent auctions, and peruse informational exhibits. All members of Ruritan are welcome to attend the convention! Tickets must be purchased for admission to the installation banquet. This is an opportunity to meet the Ruritans that are running for a National office and hear what they have to say about their hopes for the future of our club and how they plan to help Ruritan National accomplish our goals on a National level. We learn about what the other clubs in the District have accomplished. We recognize, thank, and applaud the outstanding achievements of the clubs and individual club members during awards presentations and ceremonies. Examples of the individual club members awards handed out during the District Convention include perfect attendance awards and Ruritan of the Year awards. The local clubs are asked to send two delegates to the convention. These delegates represent the clubs during the business meeting when we vote on the issues brought before the District Board. These issues can affect the future of all the clubs in the district. We elect and meet the next year’s District Lieutenant Governor. We thank the outgoing District Governor for his service. 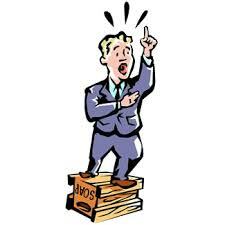 The convention is when our club officers receive important news and training to help make sure that they are up-to-date on the information they need to properly do the jobs to which they have been elected. 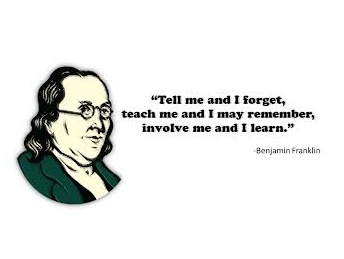 This is also a time for fellowship; to rub elbows, exchange ideas, and break bread with members of other local clubs that you may not have met before! When attendees arrive at the convention they check in at the registration tables. At that time they are given a program that details what event is happening where, and at what time. We sell advertising space in the program to help defray the cost of holding the convention. The more ads that we sell, the less expensive the admission tickets will be! Proceeds from those sales help cut the admission price for the people who come to this very important and fun event. In addition to helping to defray the costs and reduce the ticket price to the Convention, local clubs receive a 20% rebate from the ads that they have purchased/sold. Selling program ads directly benefit the local clubs! The rebate checks will be awarded to the clubs during the convention. From our District Program Book Chairperson, Fulton Payne: Now is the time for our local Ruritan Clubs to start selling program book ads for our Convention Program Book. The ads are $80 for a full page, $40 for a half page, $20 for a quarter page and $10 for an eighth page. 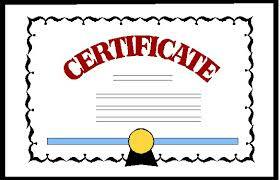 As an extra bonus and incentive for businesses to purchase ads, any business that purchases an ad will receive a free link to their business website for one year on our official website, http://www.rapidandistrictruritan.com. Please ask the purchaser of the ad to make the check payable to “Rapidan District Ruritan” and send the check and ad to: Fulton Payne, 855 Deerfield Rd., Louisa VA, 23093. His telephone number is 434-589-8797. Checks without the ad or ads without the check will not be accepted. The Cabinet asks each Club to take an ad for their Club, any size, so we could have 100% participation for the District. Please have your ads “camera ready.” Please provide new copies of your ads since we will be unable to use previous ones. Fulton will be glad to assist you with this if you need help. If you would like to e-mail your ads you can send them to Fulton at esp@embarqmail.com. The absolute deadline to submit ads is October 1st. Ads received after that date will not appear in the 2014 Program Book. Please plan to attend our convention, and help our Rapidan District have a great 2014 convention and a great year in 2015! 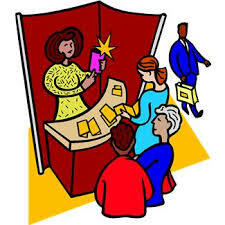 If you are planning to attend the convention, please call Al MacDonald, District Governor ASAP at 804-556-5233.